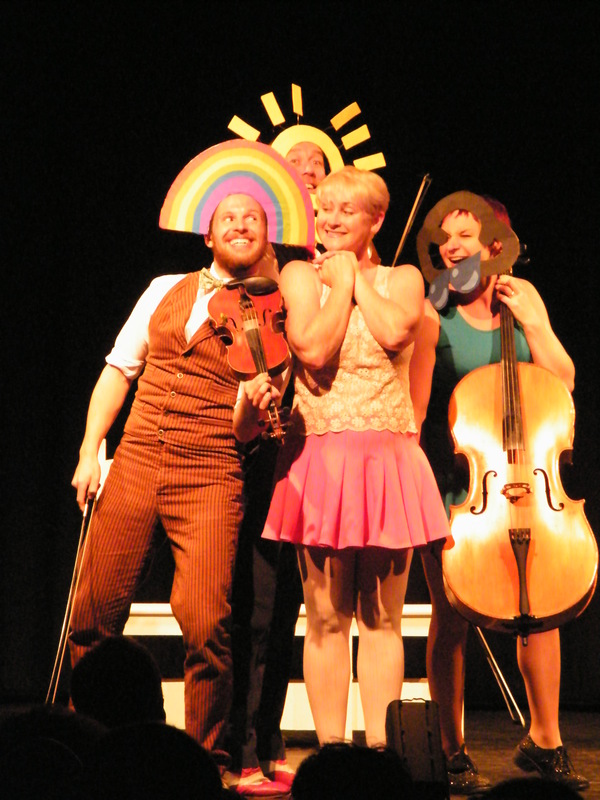 Now there’s a ‘full house’ and there’s a house full fit to burst which is what happened when the team of four, Ezme, Bertie, Ed and Mitch, aka Bowjangles on the Box appeared at the Marine Theatre in the wonderful seaside town of Lyme Regis Dorset. As the house lights dimmed, the audience, many still happily sun-kissed after a day on the beach, were immediately awestruck by the string quartet that burst onto the stage and launched into their first song; ‘Good Morning Good Morning’, that lively and vigorous hit famously performed by Gene Kelly, Debbie Reynolds and Donald O’Connor in Singin’ in the Rain, which this time was the opening sketch to this remarkable production. 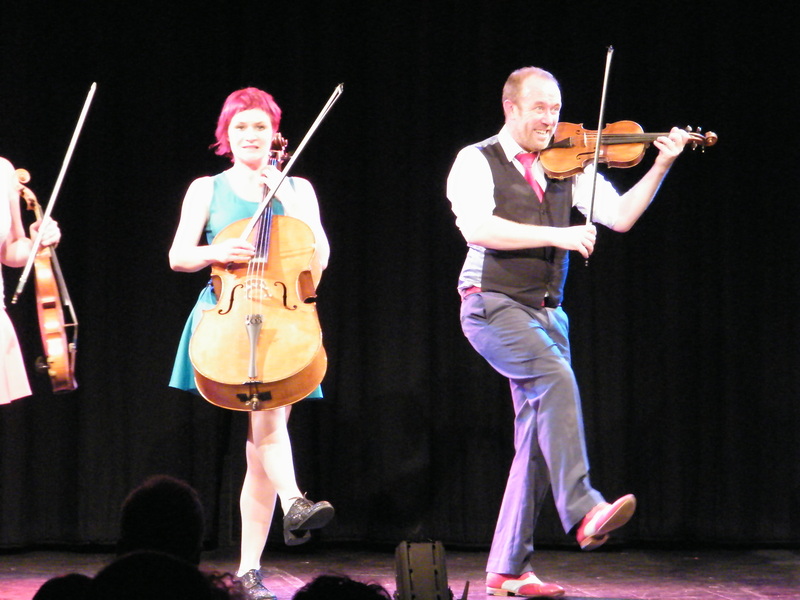 The energetic foursome were equally enthusiastic but with the added twist of playing violins and a cello whilst singing, dancing and haring around the stage as they went on to present a comprehensive day of TV viewing on the BJBC (Bowjangles Broadcasting Corporation) channel. From children’s programmes to the headline news, soap opera to sports coverage at the Bowlympic Games, they not only leapt from chair to chair with acrobatic prowess, they re-enacted a wide range of sporting events including a tennis match and a marathon…in slow motion! All accompanied by their dexterous violin and cello playing. We soon discovered why a song sheet had been left on every seat; audience participation is not an option and it’s not long before everyone was singing along to Monty Python’s Always Look on the Bright Side of Life! And the audience participation didn’t end there; during a game of tennis the virtual ball is hit off stage so they naturally ask someone to pass it back; it’s not long before someone gets into the spirit of things and happily ‘throws’ the imaginary ball back into court. 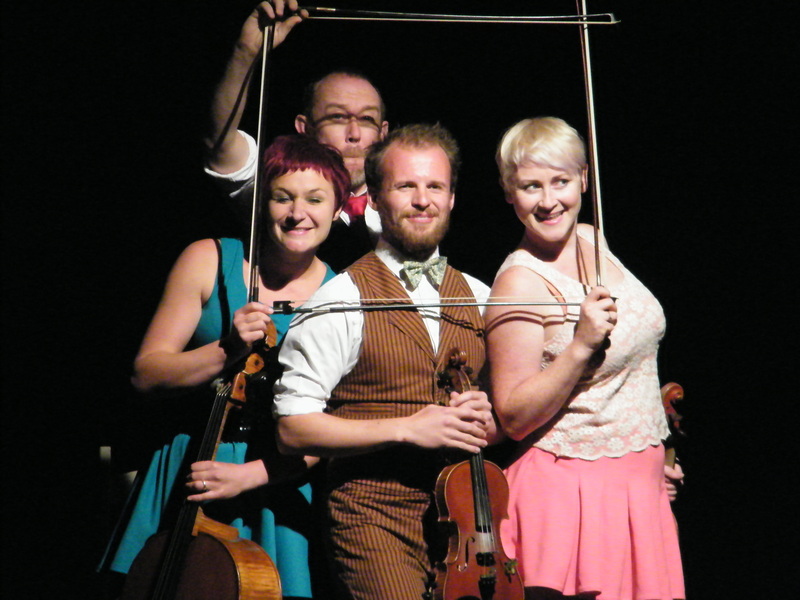 Using their bows as swords, dancing the Charleston during a Strictly show and being chased by monsters in a horror movie, it seems there is nothing that cannot be broadcast without a string quartet! Then just when you think it’s all over, it’s not because you get to see what happens when Vivaldi’s ‘Four Seasons’ combines with Arthur ‘Guitar Boogie’ Smith’s ‘Duelling Banjos’. And not wishing to let the audience sit for too long, the entire auditorium is soon on its feet following a dance routine that has everyone in fits of laughter. Dad quite liked the weather forecast! Mr & Mrs Lewis were here for a second helping having seen Bowjangles when they were last in Lyme; they enjoyed it so much they thought they’d come again and they weren’t disappointed! As the audience filed out, the happy humming of the ‘Duelling Banjos’ filled the air! This entry was posted in Theatre and tagged Bowjanlges on the Box, Dorset, Lyme Regis, marine theatre, musical, show, television, theatre. Bookmark the permalink.